Originally published under the title, "Like-to-like ethnic migration in the Middle East: Syria's civil war could end up stabilizing the region." Majority Arab (yellow) and non-Arab areas of the Middle East. Ironically, amid tragedy and horror, as populations adapt to the brutal imperatives of modern nationalism, all four countries are becoming a bit more stable. That's because the fighting has pushed peoples to move from ethnic minority status to ethnic majority status, encouraging like to live with like. Unprecedented violence in the Middle East is encouraging like to live with like. First, along with the Balkans, the Middle East contains the most complex and unsettled ethnic, religious, linguistic, and national mix in the world. It's a place where cross-border alliances deeply complicate local politics. If the Balkans set off World War I, the Middle East might well spark World War III. Second, historic tensions between the two main Muslim sects, Sunni and Shi'i, had largely subsided before Ayatollah Khomeini's rise to power in 1979. Driven by Tehran's aggression, they have since flared anew. Third, the imperialist European powers nearly ignored the identity of the peoples living in the Middle East as they defined most of the region's borders. Instead, they focused on rivers, ports, and other resources that served their economic interests. Today's jumble of somewhat randomly defined countries (e.g., Jordan) is the result. Finally, Kurds were the major losers a century ago; lacking intellectuals to make their case, they found themselves divided among four different states and persecuted in them all. Today, they are organized for independence. Sunnis (light green) and Shi'is (dark green) dominate the religious mosaic of the Middle East. 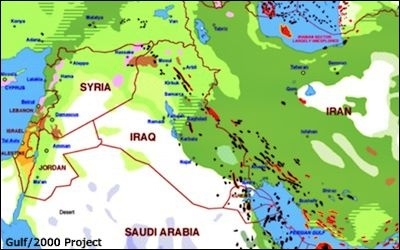 Syria and Iraq have undergone strikingly similar developments. After the demise of monstrous dictators in 2000 and 2003, each has broken into the same three ethnic units – Shi'i Arab, Sunni Arab, and Kurd. Tehran dominates both Shi'i-oriented regimes, while several Sunni-majority states (Turkey, Saudi Arabia, UAE, Qatar) back the Sunni rebels. The Kurds have withdrawn from the Arab civil wars to build their own autonomous areas. Once-ambitious dictatorships barely sustain functioning foreign policies. Also, the century-old boundary separating Syria and Iraq has largely vanished. Syria: The part of Syria still ruled by Bashar al-Assad is becoming more Shi'i. An estimated half of the pre-war Syrian population of 22 million has been driven from its homes; of them, the 3 million refugees, mostly Sunni, who fled the country are unlikely to return both because of the continuing civil war and the Assad regime's revocation of their citizenship. The regime appears also to have intentionally reduced its control over the area near the border with Jordan to encourage Sunnis to flee Syria. In another ploy to increase the Shi'i population, reports indicate it has welcomed and re-settled about 500,000 Iraqi Shi'is, conferring Syrian citizenship on some. 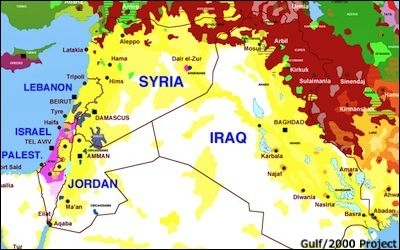 However gruesome, the Syrian civil war potentially renders the Middle East a less combustible place. Iraq: The Syrian civil war provided the Islamic State (or ISIS/ISIL) with an opportunity to move into Iraq, seizing such cities as Fallujah and Mosul, leading to an exodus of non-Sunnis (especially Shi'is and Yazidis), and remaking Iraq along ethnic lines. Given the country's intermingled population, especially in the Baghdad area, it will be years – perhaps decades – before the sides sort themselves out. But the process appears inexorable. Lebanon: Sunnis are growing more powerful, beating back Iranian influence. The million new Sunni refugees from Syria now constitute 20 percent of the country's population, roughly doubling the Sunni community. Also, Hizbullah, the dominant Shi'i organization in Lebanon, is neglecting its own constituency and losing influence domestically by fighting on behalf of the Assad regime in Syria. Jordan: The recent influx of Syrian refugees follows an earlier wave of approximately one million Iraqi refugees. Together, the two groups have lowered the percentage of Palestinians in Jordan to the point that the latter probably no longer constitute a majority of the country's population, a shift with major political implications. For one, it reduces the potential Palestinian threat to the Hashemite monarchy; for another, it undermines the Jordan-is-Palestine argument championed by some Israelis. In brief, Iraq and Syria are devolving into their constituent religious and ethnic parts, Lebanon is becoming more Sunni, and Jordan less Palestinian. However gruesome the human cost of the Syrian civil war, its long-term impact potentially renders the Middle East a less combustible place, one less likely to trigger World War III. Related Topics: Demographics, Immigration, Iraq, Middle East patterns, Syria | Daniel Pipes receive the latest by email: subscribe to the free mef mailing list This text may be reposted or forwarded so long as it is presented as an integral whole with complete and accurate information provided about its author, date, place of publication, and original URL.